Civil engineers create, improve and protect the environment in which we live. They plan, design and oversee construction and maintenance of infrastructure projects, such as roads, railways, airports, bridges, harbors, dams, irrigation projects, power plants, and water and sewerage systems. A construction manager, also known as a site project manager, is required to supervise and direct various operations within a building project. This person must ensure a project is completed safely, runs on time, and adheres to the allocated budget allowance. Skilled trades are careers that require specific training, such as a carpenter, operating engineer, brick mason, paver, welder, electrician, plumber, and pipefitter. 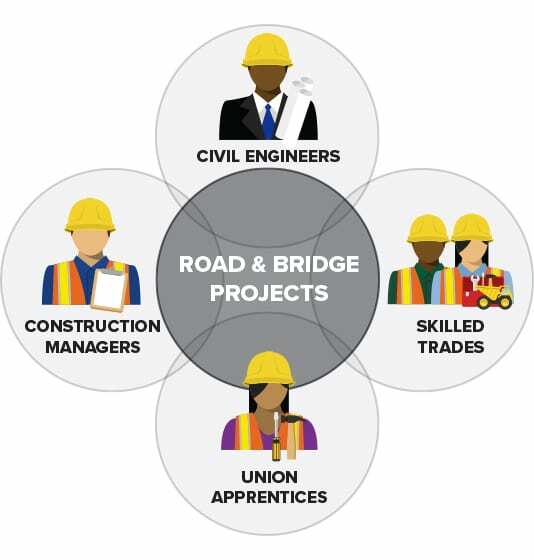 Skilled trades employees work with the site manager to build roads and bridges that were designed by civil engineers.